Kuname boasts a wonderfully pretty location – it’s nestled in gorgeous riverine forest overlooking a riverbed with the nearby Drakensberg mountains making for a magnificent backdrop! At Bushscapes we love outdoor showers and baths – and here at Kuname you actually have both! 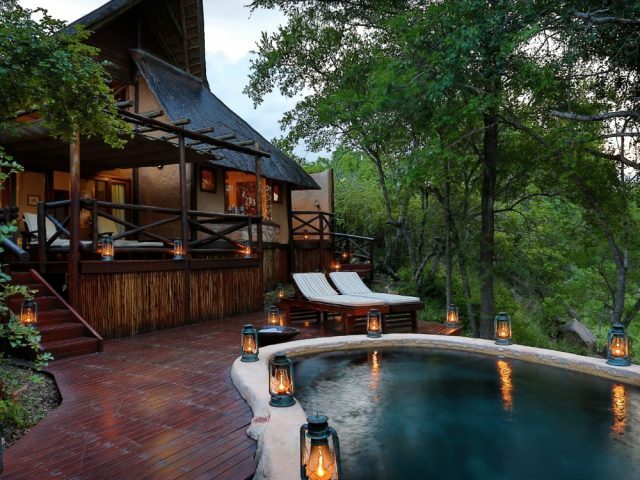 Imagine soaking in bubbles under the African sky surrounded by bush and romantic candles! We enjoyed some of our best leopard sightings ever, whilst the experience of tracking wild cheetah on foot was a once in a lifetime memory in the making! Kuname is the most upmarket and intimate of the Karongwe portfolio but perhaps doesn’t boast the same cutting edge contemporary style as some competitors – then again it’s far more reasonably priced too and still wonderfully romantic! No children allowed – but let’s face it that’s a real boost for the lodge’s romance factor! each suite features an en-suite bathroom which includes an outdoor shower and for the more adventurous there's even an outdoor bath - the perfect spot to enjoy a romantic soak in a bath of bubbles lit only by candles and a canopy of stars! 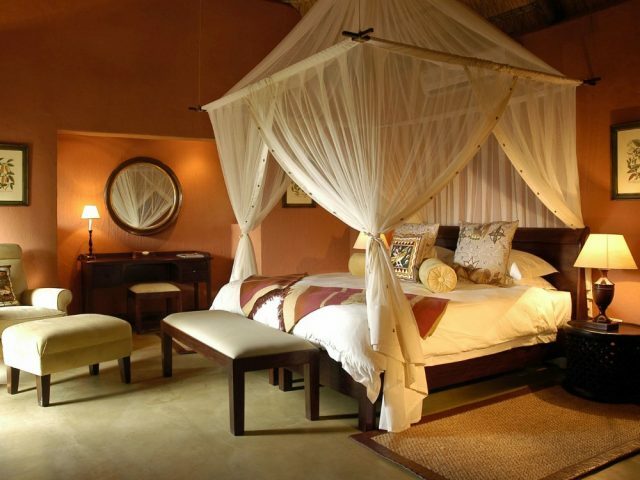 Set in the Limpopo Province, Kuname Lodge is a small, unashamedly exclusive, luxury safari lodge set in about 9 000 hectares of pristine African bush in the Karongwe Private Game Reserve. Bordered by an awesome backdrop of the towering majestic Drakensberg mountain range in the west and set in game-rich, lush, riverine vegetation, this lodge has a variety of breathtaking views, diverse landscapes and offers excellent Big Five game-viewing and bird watching opportunities. It really is a haven for those in search of a high quality and romantic bush experience! As you enter the lodge for the first time you will be blown away by the stunningly pretty location, with the lodge nestled in a beautiful forest glade with its swimming pool perched over a picturesque river bed. Built on the banks of the Kuvjename River, Kuname Lodge boasts 4 Luxury Suites and 1Premier Suite, all of them air-conditioned chalets nestled in the shade of the lovely riverine forest. The thatched chalets are elegant yet still quite rustic - built from natural materials of hewn rock and fine woods, they’re tastefully decorated with original arts and crafts to give that real feeling of Africa. One of the highlights for us is that each suite features an en-suite bathroom which includes an outdoor shower and for the more adventurous there's even an outdoor bath - the perfect spot to enjoy a romantic soak in a bath of bubbles lit only by candles and a canopy of stars! 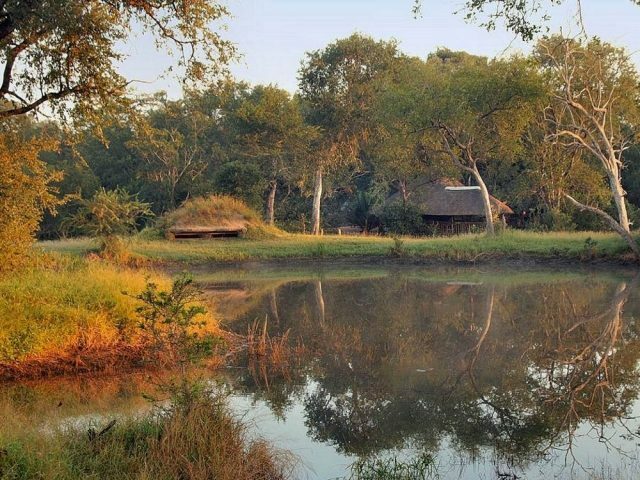 With just 5 rooms, this is truly a lodge where you can relax in a tranquil environment surrounded by the raw beauty of the African bush – and you can take it all in from your inviting private wooden deck. The main lodge houses a large, elegant lounge and dining area and cozy bar, which lead onto an elevated outdoor viewing deck which have fantastic views of the river and mountains. It's the perfect spot to relax with a ice cold drink whilst looking out for game in the riverbed below. 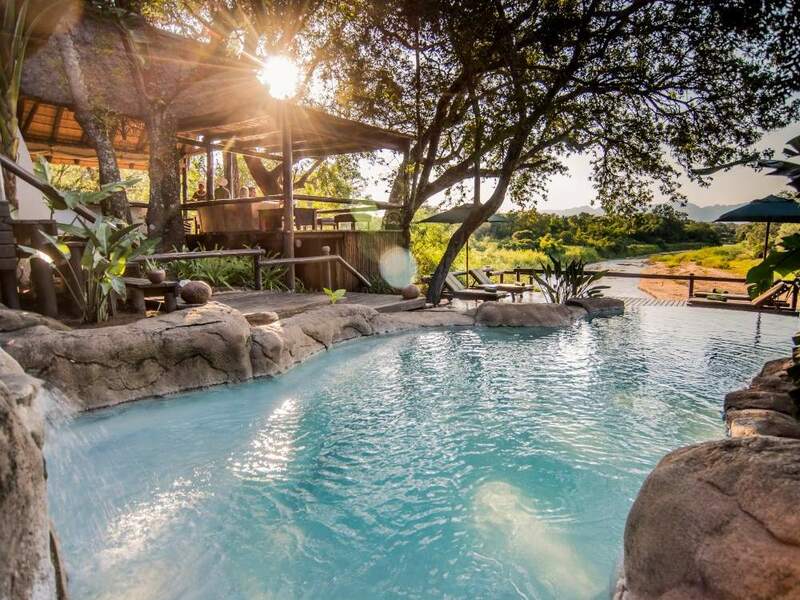 A gorgeous infinity rock pool on the deck offers the ideal setting to escape from the heat of the day - if you're lucky you might even see a herd of elephants cross the river whilst you’re busy doing your own wallowing! Dining at Kuname is a delight with every meal an unforgettable occasion. 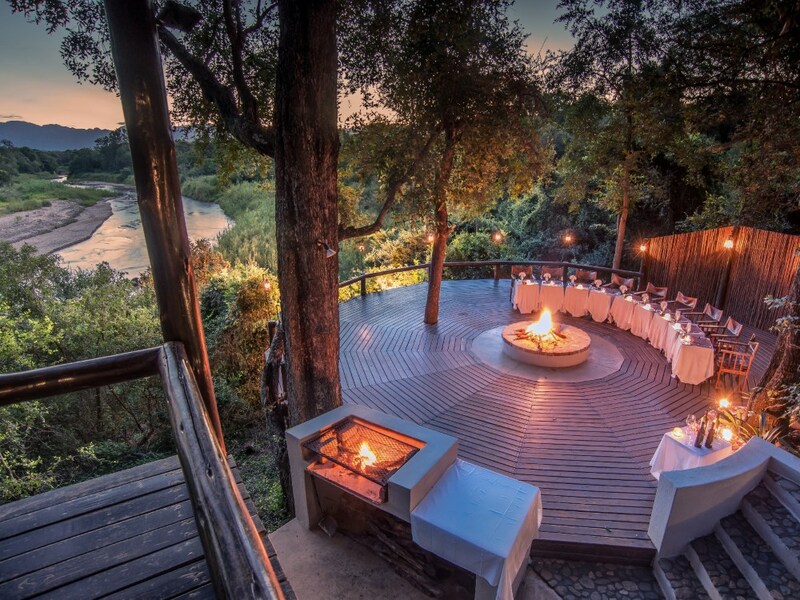 Here you can take in the earthly scents of the African bush with a braai or a more elegant bush dinner can be savoured either around the roaring fire in the boma, on the wooden viewing deck or in the more formal inside dining room – or a more intimate dinner can be enjoyed for couples who wish to dine alone in the beautifully designed wine cellar! Traversing over 9000 hectares of prime bushveld with lovely views of the escarpment as your constant backdrop, Kuname is home to the Big Five as well as a wealth of other creatures – the Karongwe reserve is very well watered with 4 rivers including the perennial Makhutsi River flowing through the reserve. This enhances the game carrying capacity of the land as well as providing stunning riverine vegetation – add in the magnificent views of the towering Drakensberg escarpment and, dare we say it, but Karongwe provides arguably better game viewing and more pretty scenery than many of the better known private reserves in the lowveld! Whilst 9000 hectares is fairly small compared to some other reserves, we never even came close to traversing the whole reserve in the 4 days we spent there, so it feels plenty big enough. Bush walks at Kuname are a chance to step into a world that few get the opportunity to experience and where you get to see animals at their own level. You’ll also learn about traditional medicinal plants from your Shangaan tracker, not to mention see veld skills in action that have been passed down from generation to generation! Afterwards retreat to the lodge and enjoy the stunning scenic backdrop as you sip a glass of champagne beside the cool, clear waters of the rock pool - or spend a lazy afternoon browsing the library while you unwind. Kuname Lodge will touch you deeply, rejuvenate you and soothe your soul, and quite frankly you will be blown away how the staff make you feel like a member of their ‘family' and treat you like royalty from the moment you arrive to the moment you depart! The hosting here is wonderfully warm and personal and makes Kuname one of our favourite lodges of all!